Tragedy of the Commons & Command Economies Lesson! Who doesn’t love a personality test? It’s almost irresistible to take the questionnaire and find out more about yourself. Well, in this lesson, I’ve turned these tempting quizzes upside-down and used them to teach the Tragedy of the Commons. All the options ask students to choose between two terrible options. My favorite is “are you more likely to leave your gum under your desk chair in your room or at school?” Once students complete the 10-question quiz, we analyze their results and talk about human behavior and tendencies. Students are completely engaged and that’s always my goal! 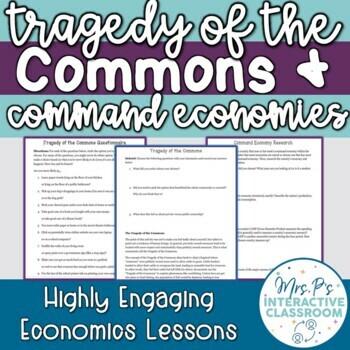 This lesson will teach your students about the Tragedy of the Commons and command economies. For this lesson, students will first take the questionnaire, then debrief their answers to the quiz, and then learn about the Tragedy of the Commons through a short reading. Next, they’ll learn (briefly) about command economies, emphasizing the connection to publicly owned land. Finally, students will research a current or past command economy and analyze its successes and failures using 8 guiding questions (in worksheet format). I love this lesson because it makes economic concepts completely relevant to students. Enjoy! I usually teach this in one 50-minute period.